Let’s consider the humble gözleme. Why? Well, have you ever met anyone who isn’t instantly grateful for its entrance into their life? We love the stuff and lots of others agree with us! Turkish food is oft ranked by experts as one of the world’s top three cuisines – no arguments from these two biased bloggers. It’s a varied, sophisticated cuisine that, over the centuries, has exported and merged into the cuisine of European and Middle Eastern neighbours and beyond. In turn, it’s often possible to see variations of dishes from other climes on the Turkish table. The kitchens of the Ottomans at Topkapı Palace were a hotbed of competition and fierce rivalry as the palace chefs sought to create dishes that would impress the sultan of the time. These chefs were from countries that made up the Ottoman Empire so their spices and ways of cooking were imported into the palace. The result? Ottoman cuisine is a wonderful gift to the foodie world and we get to relish dishes such as the lamb and aubergine of Hünkar Beğendi, köfte dishes, pilaf and dolma (to list just a few). And all of that is great. We love to eat out and cook at home; experimenting with different Turkish dishes. But it’s the simple things in life that are often the most memorable and the ones that feature most in your daily life. Gözleme – or saç böreği – is that dish. A super tasty Anatolian flat bread with various savoury fillings really does the trick when you’re looking for a snack that’s gonna fuel you for a good few hours. It wasn’t so long ago that gözleme was labelled as ‘village food’ and you didn’t really see it on the menu boards of eateries very often, except when you were travelling around more rural areas. Thankfully, in the years that we’ve lived here, all of that has changed, and we, along with millions of other food lovers in Turkey, can’t get enough of gözleme! 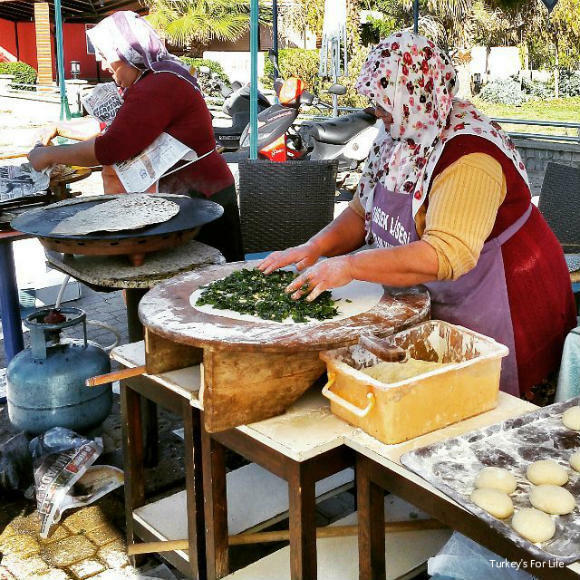 Ahh, the beauty of Turkish gözleme is that there’s a whole foodie process involved. Being able to witness the creation and building of your finished snack is just as satisfying as the eating! These women know exactly what they’re doing! The recipe is so simple. At its most simple, a basic pastry dough is made from flour and water (for some recipes, you might see the addition of yeast or egg). A chunk not much bigger than a golf ball is taken from the dough, flour is sprinkled over the low table top and the dough placed in the centre. Well, it’s just not gonna work out, is it, eh? Yeah, a good bit of British-style short crust pastry for a pie. Good to go on that one. But gözleme…let’s just marvel in watching the making process as much as the eating! The large, circular, wafer thin pastry dough is on the table and awaiting its filling. Peynirli – Cheese. In villages, this is often lor peyniri. This is a white crumbly curd cheese that is sometimes sold as ‘börek peynir’ (pastry cheese) in supermarkets. It hasn’t got a strong taste but it crumbles beautifully into börek dishes such as peynirli sigara. International recipes you see online will substitute white cheese such as feta. More luxurious but does the trick. Ispanaklı – Spinach. Oh where would we be without a spinach filling in our börek recipes? Spinach is also popular in saç böreği, aka gözleme. There’s just something about that spinach and (any type of) pastry combination that we never even knew existed before we came to Turkey. Yeşillik. Love this word! It’s a free for all. Order a gözleme filling of yeşillik and you’re gonna get a thin, crispy pastry filled with ‘greenery.’ That’s what it means. It can be anything from chopped herbs such as parsley to salad leaves such as beetroot leaves, the leaves from celeriac or wild radish. If it’s green and edible, it might well be there. Patatesli – Potato. Now, it depends on who makes your gözleme for you. Your potato filling could be grated potato that cooks while it’s on the saç – Barry’s preference. Or it could be pre-boiled small chunks of potato that are then smashed; not mashed. My preference. Kıymalı – Minced Meat. Mmmm, pre-cooked minced beef or minced lamb, preferably (for me) with finely chopped onion. We’re writing this article as Fethiye dwellers and we happen to know that, elsewhere in Turkey, patlıcanlı (roasted aubergine) is also a popular filling. We love aubergine with börek but it’s not a common filling in our little corner of Turkey. Anyway, as we said above, do as you will with the permutations. 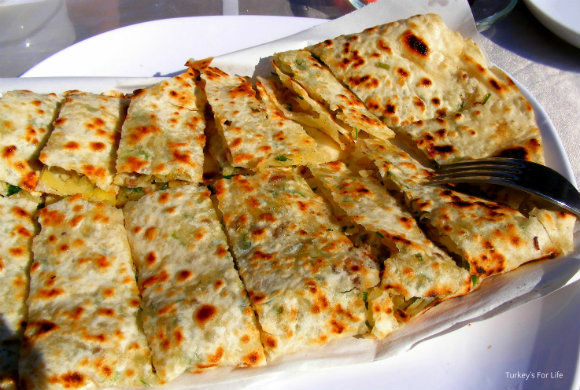 We love kıymalı patatesli gözleme. Karışık (mixed) is popular; potato, cheese and the greenery of the moment. Each to their own. The filling completes a semi-circle on the dough and the other half is expertly rolled onto the oklava and then unrolled out across the top of the filling. Oil is drizzled over the red hot saç and then, another deft move with the use of an over-sized spatula. The whole thing is transferred from the table to the sizzling hot saç without a drop of filling escaping. There it sits for a couple of minutes before being flipped over. Apparently, this is where saç böreği (pastry cooked on a hot convex metal plate) got its other name, ‘gözleme.’ ‘Göz’ means eye. 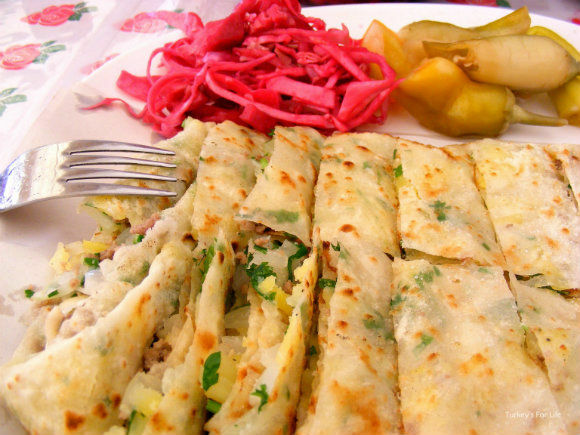 As the börek sizzles on the saç, dark spots form on the surface: ‘eyes.’ So, the saç makes eyes – gözleme. Your gözleme will either be served to you in chopped pieces or left whole, folded into quarters. If you’re eating on the go, it can even be rolled like a dürüm and you can go off on your merry way chomping at your gözleme. Ahh, but then…then you would miss out on turşu. Oh the joy of a side plate piled high with a whole variety of Turkish pickled vegetables. Enough pickles for every morsel of that yummy savoury pastry that passes your lips. Mmm, it also helps if there’s a big glass of icy cold frothy açık ayran to wash it down with, too. 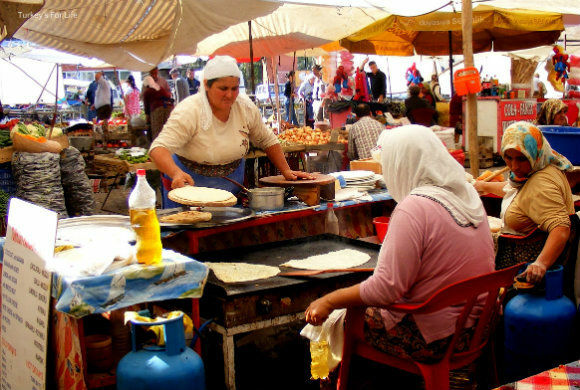 We’ve said gözleme is traditionally a village food. If you’re travelling in any rural areas, look out for roadside boards that say ‘saç böreği’ or ‘gözleme.’ Pull over and you’ll be given a real foodie treat that isn’t gonna break your bank by any means. I always remember when the fabulous, sadly no longer with us, Keith Floyd did his series, ‘Floyd Around The Med.’ He’d eaten his way through, and described, many traditional dishes of western Turkey but left the country with the fond memories of his roadside gözleme experience somewhere near the small town of Dalyan. In Fethiye, where we live, gözleme is doing a roaring trade and long may that last, we say! 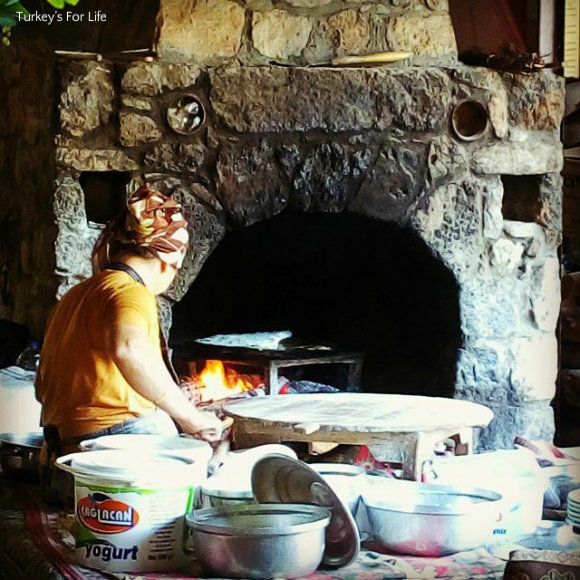 The village of Kayaköy is perfect surroundings to enjoy gözleme. Bülent’in Yeri on the main road through the village is great, as is Antik Restaurant. They both use open fires to heat their saç and you can watch the ladies rolling and building your eagerly awaited snack. 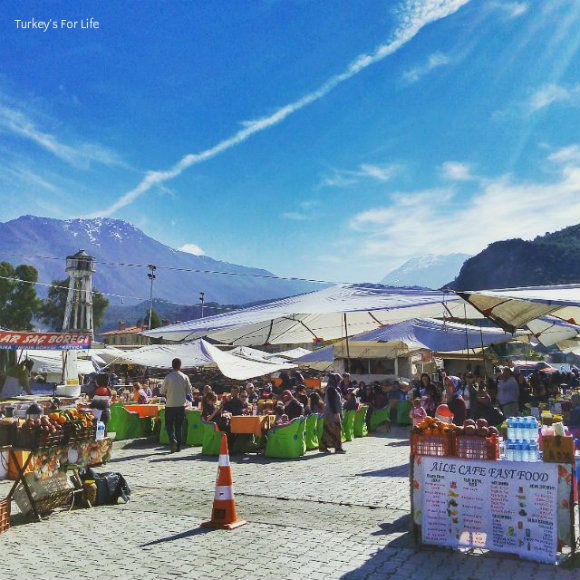 Weekly markets such as Fethiye Market on Tuesday and the village market on Friday, the Sunday Çalış market and every Monday in Hisarönü are packed with gözleme, homemade bazlama and kebab-eating customers. Most of these stalls are families who come along from nearby villages to cook their foods for you. And then, what we said about gözleme taking off a tad more, these days; let’s call it a gözleme renaissance. Walk along Fethiye harbour and you’ll see what we mean. It’s now possible to sit in a seafront restaurant with all manner of offerings on their menu – and some of them offer gözleme. And this scene always interests me, too. 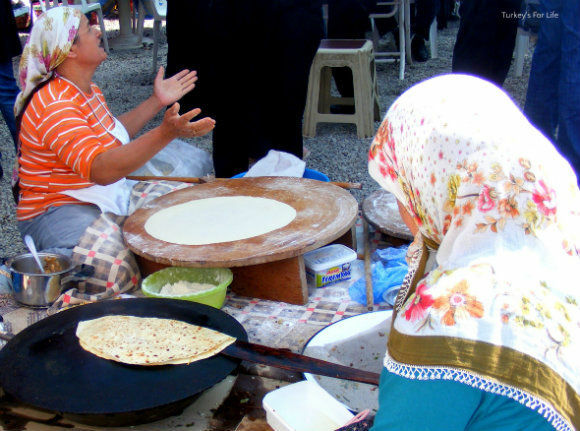 Gözleme is the domain of the village lady. In the mind’s image, she is often wearing her şalwar and headscarf as she sits on the floor at her low table, expertly rolling her pastry. Ahh, well gözleme now also has a rightful place on some hotel menus, too. 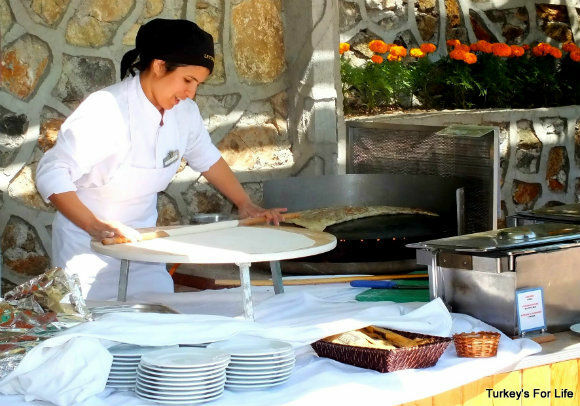 Odd to see a chef in her crisp chef’s whites on the beach at Letoonia Hotel & Resort rolling out her pastry – but great that this traditional Anatolian food is being served up to guests. I’m a bit of a stickler for giving foods their native name (too many reasons to chunter about in this article) but with the phrase ‘pancake’ has also come the traditional pancake fillings. We’re talking those pancakes of the Pancake Tuesday / crepe variety here. So, in holiday resorts, you’re going to see fillings such as lemon, sugar, honey, banana and chocolate spread. All very well. Our friends’ kids love them. But just know, should you stray elsewhere, away from those resorts, saç böreği or gözleme is a savoury pastry. Order something sweet and expect to be looked at as if you have just fallen from the moon. So that’s it. Our ode to gözleme – one of the most simple yet tastiest of Turkish dishes. If you know gözleme, you’ll probably agree with us. And if you don’t; well, if you visit Turkey anytime, make sure you don’t leave without enjoying the gözleme foodie experience. It’ll stay with you. It’s my favourite Turkish indulgence! Potato, cheese and ot for me. Please, what is ot? I don’t want to miss out on anything! Hi Judy, ‘ot’ is the Turkish word for ‘herb’ and this is also used as a filling in gözleme. Ot and yeşillik are often interchangeable when it comes to gözleme and börek fillings because it’s the gree, leafy herbs that are used such as parsley and purslane. Just copied the link of your lovely article to my FB page to stir up a bit of a food discussion. 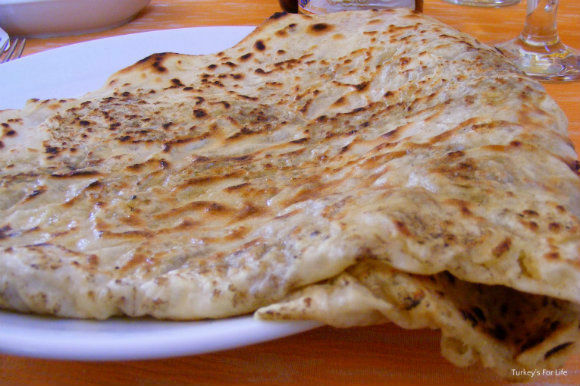 Here, in Dalmatia, there is the “original” Soparnik, a local delicacy similar to Gözleme , inherited from the Turks when they “visited” the Poljicka Republika. Although I like Soparnik a lot, nothing beats Gözleme, the perfect street food in Turkey. cheers, Pim de Vos in Split.